There's a huge hidden collection of great music on your SD cards! installed: Audacious or DeaDBeeF (or Audiorace!). And of course you need to have some games installed. Wars: Commando, Widelands, wizznic, Xmoto, Znax, Zoid's Quest. be included in the next update! 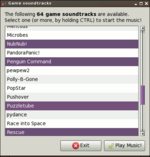 Listen to the soundtracks of your games! 5 / 5. Also you can edit the PND to add games that are not supported by this release. Hey _wb_, this PND does not work anymore (music players fail to start), could you have a look and fix it ? Regarding VVVVVV, the data file is @ /media/(sdcard)/pandora/appdata/vvvvvv/data/vvvvvvmusic.vvv. You still need that python script (or similar) to decrypt it though. 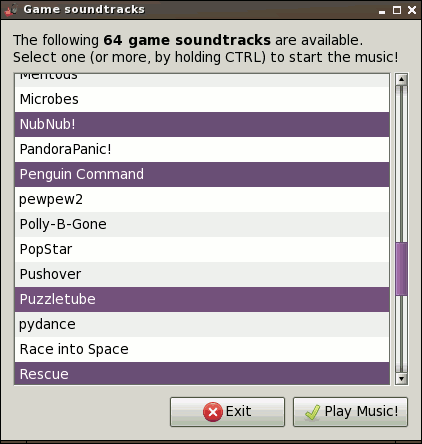 Can you make it play Baldur's Gate and other GemRB games' music?